I’m still not quite sure what possessed my husband to think we’d need a 17lb turkey for just the two of us but let’s just say we’re not short of leftovers right now. After delicious Thanksgiving sandwiches yesterday, I figured I’d try my hand at a Thanksgiving pie to try to make a dent in the baggies and baggies of food hanging out in the fridge. 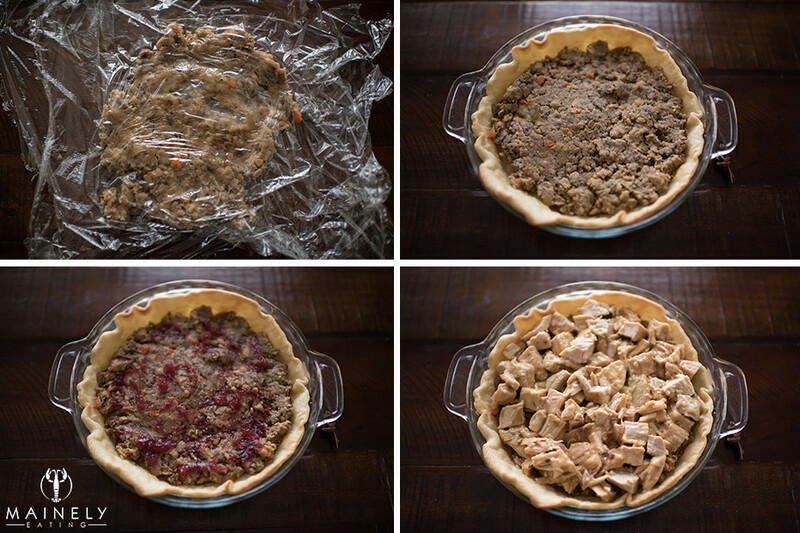 Ready-rolled pie crust placed in a greased pie dish, pricked to prevent it rising and baked in a 400 degree oven for 12 minutes. We had turkey and stuffing galore but thought I’d caramelize a finely sliced onion for a little more flavor. 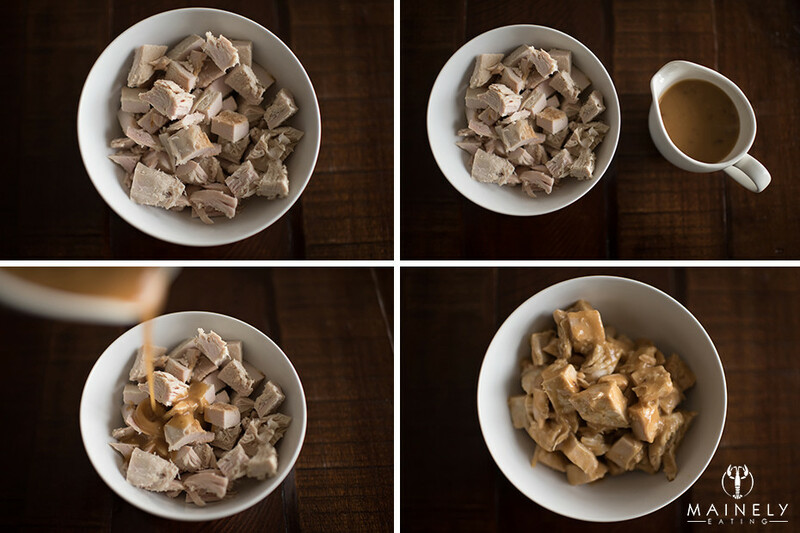 Dice up the leftover turkey (or leave it in slices or shred it, whatever your preference). There’s nothing worse than a pie with a dry filling so why not use up any leftover gravy?. If you don’t have any leftover gravy you could maybe use a little chicken stock. You want to add just enough to make it moist, not sloppy. If your stuffing is coming straight from the fridge it can be hard to spread in a thin layer without causing damage to your fragile pastry. I dumped out the stuffing onto a layer of saran wrap, added another layer of saran wrap and squished in into a round shape before tipping it into my pie dish. Try not to squish it too much or it will get too dense. I added a couple of spoons of leftover Cranberry sauce spread out thinly over the stuffing before adding the turkey. 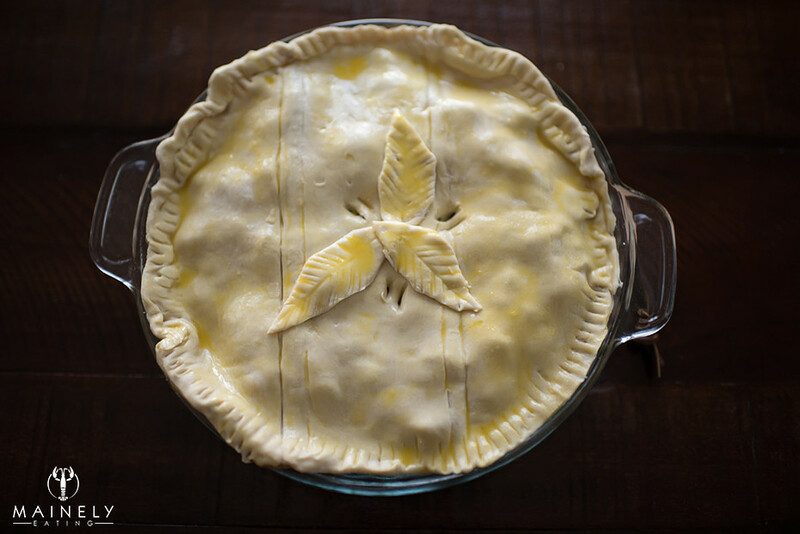 Trim the corners off the puff-pastry sheet to make a round pie shape (save them to make leaves if you’re feeling crafty) and pop on top of the pie. Use your fingers or the tines of a fork to crimp the edges together. Brush with a little egg wash and add your pastry leaves if using. I realized I’d usually add a little vent hole where my leaves where so I made a few alternate holes! 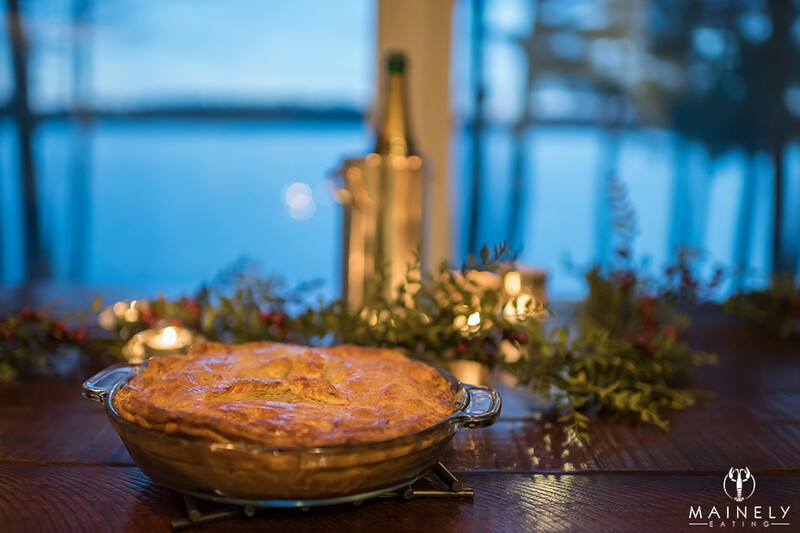 This entry was posted in Brunch, Dinner, Home cooking, Leftovers, Make Ahead and tagged Thanksgiving leftover recipes, Thanksgiving pies, Turkey leftover recipes by Mainely Eating. Bookmark the permalink.